ABC Blocks or alphabet blocks. Letters, pictures and numbers painted on the 6 sides of each of 26 wooden blocks. Each block shows an alphabet in the upper case, lower case, the picture of an item which word starts with that alphabet, the word of that picture item, a number symbol, or a number written in word. Size of each block is 3.5cm or 1.375" on each side of each block. 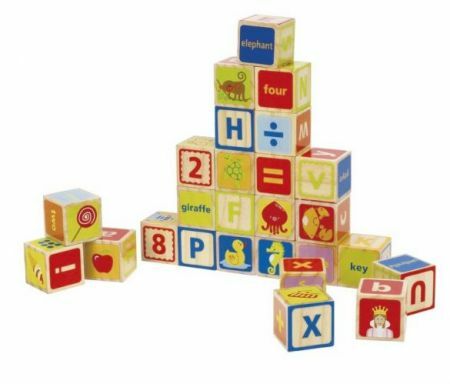 The blocks can be used for stacking or building. Included cloth bag for storage of the blocks. For Ages 2 - 5.